If you know someone who can recommend a reputable maker or business, start there. 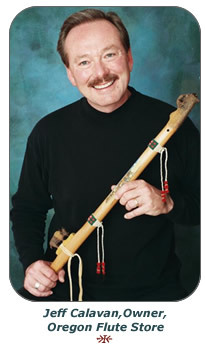 If you don't then visit the International Native American Flute Association at www.inafa.org. There you will find a directory of makers and companies. This will not insure positive results, but you will be working with someone who is dedicated to the craft. When you contact a business pay attention to how long they take in responding to you. This will give you an idea on how committed they are to service before and after. Once you have contacted the maker or business of your choice you will need to ask a few questions. How long have you been making or carrying flutes? Who uses the flutes you make or carry? Is there anyone in my area that I could visit or a store who carries your flutes? Do you guarantee your work? For how long? Do you ship UPS or US postal service? What are you hoping to get from the flute? How did you come to the flute? Do you like low tones or high tones? Is there a certain key that you like? Do you like the look and feel of hardwood or softwood? What type of animal or bird to you relate to? This sounds like a lot of questions but the more they know about you and you about them, the better the chance of a first good experience. Once you have decided on a flute then you will need to talk price and value. By value I mean do they have package deals that will save you some money. If you are planning to travel away from home with your flute then consider a protective case. Do they carry them? Also you will need to learn to play this flute. Do they carry how to play books or videos? If not then have them recommend to you a business or person that they trust and can help you find these items. Combining products will save you time and shipping expenses. However, a word of caution. The higher price doesn't always equal high quality. And reverse holds true for the less expensive flutes. I would ask to hear the flute or flutes played over the phone. This will give you a better understanding of the tonal quality, and how well the maker or person plays. Ask them to play a variety of keys and woods. If they will not, then find someone who will. If you have access to a store, then take the time to go play them for yourself. If you don't feel comfortable, then ask the owner to play for you. The bottom line here is to do your homework and ask a lot of questions. And above all have fun. My new Nest flute pack is beautiful and it arrived right on time, 10/16/09. I got home from work and my son and his family were waiting to take me to dinner for my Birthday and here was this large package that they wanted to know about. I told them it was a birthday present that was ordered in August, to be shipped for my Birthday. They said nobody can get a birthday present shipped to arrive "exactly" on the day you want it from out of state. I told them they just didn't know, nor understand the Family Attitude that goes along with the business of the Oregon Flute Store. That you all go that extra mile to "Make it So" in these sorts of cases. It was great getting my nest on time and to be able to brag up the Oregon Flute Store and your "perfect" delivery timing.